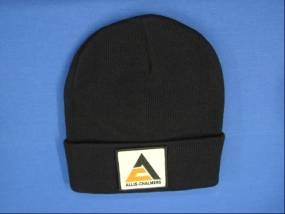 Allis-Chalmers Triangle Logo, Applied To A 12" Beanie, Winter Hat, Toque, Stocking Cap, Knit Hat, Whatever, With Cuff. 60/40 Cotton/Acrylic. Adult, One Size Fits All. It's Stretchy !